It’s times like these, when the semester is on its last kegs, that some reflection is in order. After crawling through a range of bars in downtown Middletown over the past five months, at different levels of sobriety and jollification, we decided it was high time to rank these haunts. These mainstay Forest City watering holes vary in atmospheres, offerings, deals, and so much more. We wanted to go where everybody knows our names, where they’re always glad we came. And so we have taken the time to imbibe at our fair share of stomping grounds, and after hours of deliberation, debate, and hobnobbing, the following have made our extremely persnickety list. Though perhaps not the first drinkery that would come to mind when you picture a hip, evening hangout for Dirty Birds, Esca Happy Hour has stood the test of time as a solid rendezvous spot, particularly on Thursday evenings—when happy hour is extended from the usual 4:30 p.m. to 6:30 p.m., instead lasting a whopping five hours from 5 p.m. to 10 p.m. With a selection of $5 wines and cocktails, $3 beers, and $7 martinis, it is hard to find a better bang for your buck if you’re looking to get top heavy. For those interested in the consumption of food along with their drink, Esca offers a somewhat diverse collection of bar bites for anywhere between $4 and $7. Along with these splendiferous deals, Esca offers its guzzlers a mixed atmosphere of locals and students, both just giving “relaxation” the ol’ college first-year try. 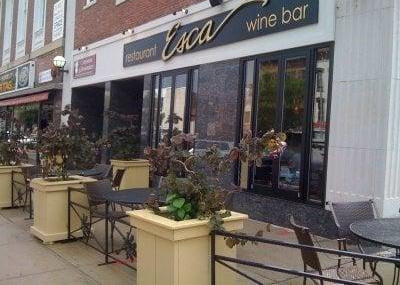 You can find Esca on the southwest corner of Washington Avenue and Main Street. 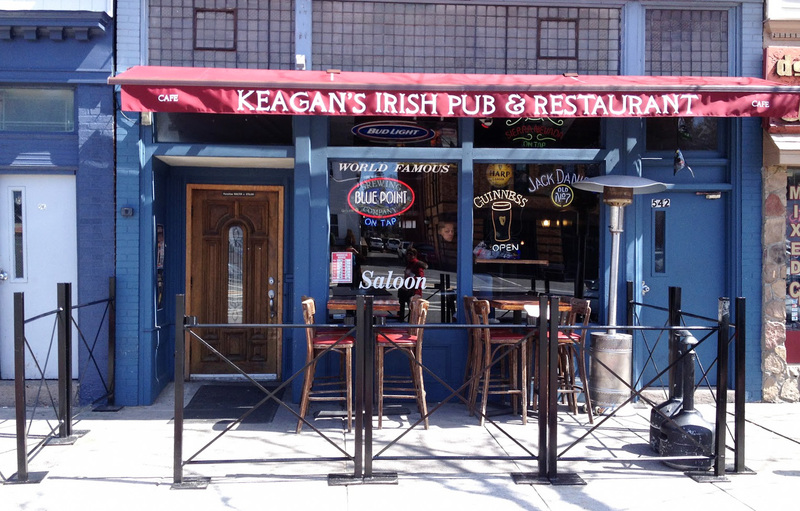 A couple of blocks north of Esca, Keagan’s Irish Pub is a tried and true classic. The Pub is more than just a run-of-the-mill trysting place. It hosts weekly functions that range from open mics to live music nights to DJ sets on the weekends. Beyond these exciting events that are bound to enliven anyone’s night on the town, the dive offers a killer happy hour deal that is sure to get any Carousing Cardinal ready to paint the town red and black. According to the lovely patron who answered our inquiring phone call, happy hour “pretty much begins when we open” and lasts until 6 p.m. on weekdays, selling a selection of $3 beers on tap. For those jonesing for nibbles to pair with their brews, the Pub has a wide range of barbecue eats that, though not anything fancy, certainly get the job done. Mark your calendars for the next St. Paddy’s—this joint was literally table-bangingly lit. Don’t miss out on this diamond in the rough. The Hop Knot is a personal favorite of one of these authors, but for the sake of objectivity, it’s sliding in at the number four spot. 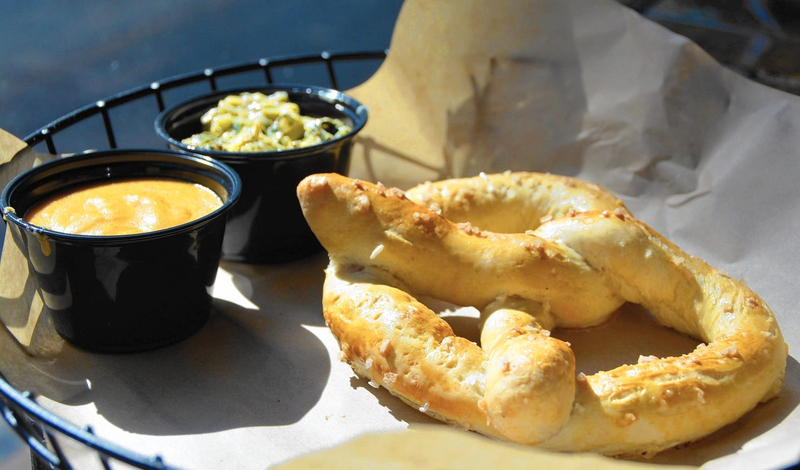 The Knot’s selling point, beyond an eclectic assortment of moderately priced IPAs and locally brewed beers, is its pretzels. These mouthwatering snacks are simply to die for. Be sure to try the Caprese Stuffed Pretzel, which is filled with tomato, mozzarella, and pesto. Also, definitely block off some time for The Knot’s trivia nights on Mondays, but be warned: They can sometimes last up to three hours. However, the prizes are well worth the wait, most of which are a random collection of knick-knacks (the same author mentioned above once won a Minions beer cozy). Hop Knot happy hour lasts from 4 to 6 p.m. on weekdays, featuring varying $5 beers, $5 cocktails, $4 wine, $3.50 pretzel bites, and an unbeatable buy-one-stuffed-pretzel, get-one-half-off deal. Take a break from all your worries at The Hop Knot’s Main Street location right above the Metro Square. If you’re a Dirty Bird willing to spend a pretty penny or two, Conspiracy is the hamlet to do it at. Nestled in a cubbyhole above The Cooking Company and located a stone’s throw from the more well-known La Boca, Conspiracy is Boca’s older, cooler cousin, who breaks a rule or two. Fair warning, though: There’s definitely a chance you could run into one of your hip professors here. Conspiracy’s low lighting is guaranteed to make anyone look more handsome, which can be a pro or a con, depending on the time. This saloon is also pre-prohibition themed, making it easy for those who swing enough to imagine they are in a different era, void of their current work and life problems. To top it off, the drink descriptions are written in such a bewitching tone that it is almost more fun to choose one than to drink one (almost). Make sure to try the Widow’s Kiss. 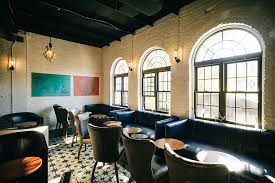 With a happy hour from 5 p.m. to 7 p.m. on weekdays, featuring beers for $5, wine for $6 and $2 off of four cocktails, you can find it all at this swanky gin mill. You’ve definitely heard your friends or your friends’ friends talk affectionately about Eli Cannon’s Tap Room. It is the glorified bar of downtown Middletown, the one with the porch that was “so much fun to chill on” when it was warm out. It also happens to be the one with the “really dope beer,” the one that the cool grad students often frequent, and the one with the killer burgers. Known for its craft beers and microbrews, Eli’s is the mainstream, hipster bar of Middletown—think your high school friends who knew all the Vampire Weekend lyrics. They’ve grown up, we’ve grown up, and we all hang out here. The dive-esque decorations that adorn the walls of Eli’s initially made these Dirty Birds feel as if they had entered a tacky airport bar, but upon venturing into the backroom, they were pleasantly surprised to find it more subdued within those intimate wooden booths. The airport aesthetic mirrors the heart and soul of Wes, which, deep down, we all know is an airport school. 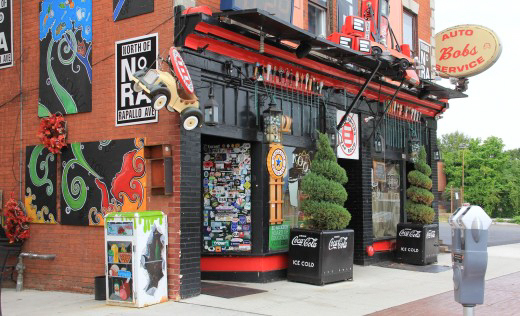 Cardinals looking for their home nest should fly yonder North End to Eli’s. While you sip on your 4-to-6 p.m. happy-hour Guinness or Franziskaner Heseweizen at $4 a pint, or a glass of the house red or white wine that goes for $5, be on the look for professors looking to wet their whistles after a long day of classes. In fact, one of this piece’s authors saw two professors the first time they visited the establishment. 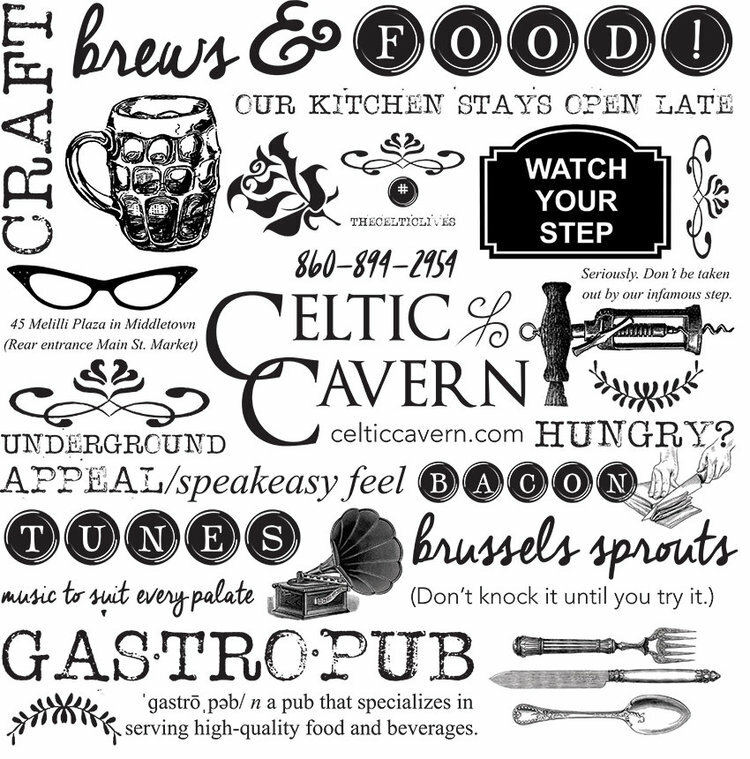 The Celtic Cavern is a must-visit at the back end of the Main Street Market, so be sure to drop in and stay a while, regardless of the begrudgingly half-hearted acknowledgments you’ll probably receive from worn-out profs. Emmet Teran and Camille De Beus can be reached at eteran@wesleyan.edu and cdebeus@wesleyan.edu and on Twitter @ETerannosaurus and @cdebeus.